It is believed that this temple exists from Tretayuga. As per the local folklore, Asuras used to live here in this forest area. In a ferocious battle between Asuras and Asuras, the weapons used in the battled fell on the Cave where the Goddess was residing. Angered Goddess, Killed the Demons and continued her ferocious form. Devas prayed for the Goddess to bring her back to peaceful form. Goddess self-manifested here on request of Devas to restore peace. Goddess Ganga and Nagamma also manifested here with Mangamma. Gubbala Mangamma Temple is located in Jangareddy Gudem, West Godavari District. It is said that Rama, Sita and Lakshman stayed here for some time. There are two mango trees near to this temple called by Rama and Lakshman to mark their presence. During Dwaparayuga, Pandavas lived here for some time after their exile from the kingdom. 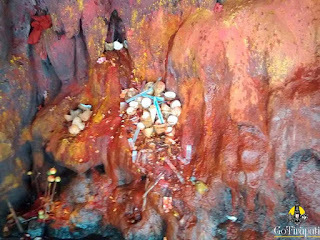 It believed that footprints of Bhima are still available here. Temple will be heavily floated on Tuesday, Thursday and Sundays.